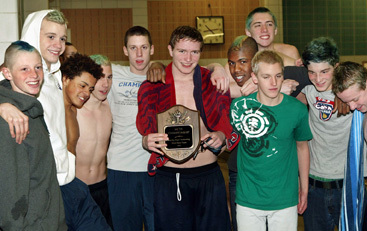 WATER WONDERS: Senior captain Peter Deardorff, with plaque, and his teammates celebrate last Saturday after the Princeton High boys swimming squad placed first in the Mercer County Swimming Championships held at the Lawrence High pool. In winning the programs first county crown since 2004, PHS produced a dominant victory, piling up 338 points with three-time defending champion Notre Dame a distant runner-up at 193 and WW/P-S taking third with 183. Though Princeton University is looking for alternate sites for its Steven Holl-designed arts center, the municipalities may pursue a dialogue with the heads of Princeton University aimed at a consensus about the originally proposed Arts and Transit Neighborhood plan that would redesign the area at the intersection of Alexander Road and University Place. A determination of community support for pursuing a case against the 2010 revaluation will take place at a public meeting on Wednesday, February 9, at 7:30 p.m. in Township Hall. The fundraising campaign for the new hospital being built in Plainsboro was recently expanded by Princeton HealthCare System (PHCS) from $115 million to $150 million in private donations. The deadline for meeting the new goal is March 2013, a year after the hospital is slated to open. A rarely seen side of Albert Einstein is showcased at the Historical Society of Princetons (HSP) latest exhibit, which displays furniture and personal items that the physicist used in his home on Mercer Street, where he lived from 1933 to 1955. Its lovely to be here just to report and not actually be asking you for anything, observed Princeton Public Library Executive Director Leslie Burger as she began her annual report to Township Committee at their Monday evening meeting. A two-in-one exhibit featuring a pair of American icons is opening on February 19 at The James A. Michener Art Museum in Doylestown, Pa., where it will be on view through May 19. “Elvis at 21: Photographs by Al Wertheimer” features the work of a young photographer who spent several weeks with a very young Elvis when he was on the brink of superstardom. “Muhammad Ali: The Making of an Icon” includes more than 50 photographs of Ali’s personal life as well as some of the more famous episodes from his career by photographers such as Annie Leibovitz, Gordon Parks, and Art Shay. After thoroughly dominating the preliminary session of the Mercer County Swimming Championships last week, the Princeton High boys swimming team sat in the pole position for the finals on Saturday.